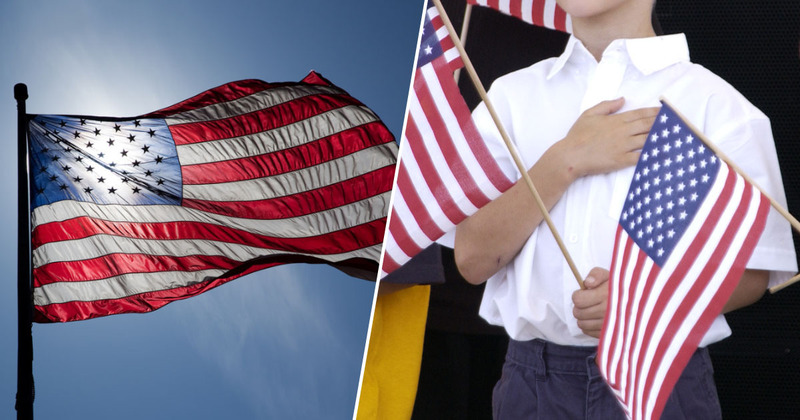 An 11-year-old boy has been arrested for allegedly creating a disturbance in his classroom, after refusing to stand for the Pledge of Allegiance. Law enforcement was called to the incident on February 4 by a substitute teacher, identified by district officials as Ana Alvarez, because she did not want to keep ‘dealing with him’. Alvarez was unaware of the First Amendment right which prevents schools forcing students to recite the pledge or salute the flag. It’s a ruling by the Supreme Court which dates back to 1943. So, the Lawton Chiles Middle Academy student had every right to tell his teacher he didn’t want to stand for the pledge. According to a statement made by Alvarez, the class member said he felt the flag was ‘racist’ and the national anthem offensive to black people. After a verbal dispute during which Alvarez appallingly suggested the boy could ‘always go back’ and live elsewhere if it was ‘so bad here’ in America, the Cuban substitute teacher called the police. The boy was then arrested for causing a disruption and refusing repeated instructions from school staff and law enforcement – not for failing to stand for the pledge – Polk County Public Schools spokesperson Kyle Kennedy said in a statement. The sixth-grader – the same age as a Year 7 student here in the UK – was reportedly asked to leave the classroom by an administrator 20 times, and is alleged to have made threats while being escorted to the office. He was then taken to The Juvenile Assessment Center and charged with disrupting a school function and resisting an officer without violence, the Lakeland Police Department said. Dhakira Talbot, the boy’s mother, told Bay News 9 she wants the charges dropped, and denied the arrest affidavit accusing her son of threatening to beat the teacher. She was wrong. She was way out of place. If she felt like there was an issue with my son not standing for the flag, she should’ve resolved that in a way different manner than she did. I’m upset, I’m angry. I’m hurt, more so for my son. My son has never been through anything like this. I feel like this should’ve been handled differently. Talbot concluded by saying she felt if any disciplinary action had to be taken, ‘it should’ve been with the school’ and her son ‘shouldn’t have been arrested’. The Pledge of Allegiance and the national anthem have been sources of tension after President Donald Trump denounced former San Francisco 49ers quarterback Colin Kaepernick. Kaepernick famously took a knee during the national anthem as a brave act of protest against continuing racial injustice and police brutality. His defenders understand Kaepernick was well within his rights of free speech. Meanwhile, Alvarez no longer works as a substitute in the district, Kennedy said, adding the district will also review training for substitutes.